You have already purchased a high-quality transfer press, but do you prefer the transfer to the professionals? Then contact us! YOW! Offers you various full-color and professional printing services for the creation of textile transfers, even from small print runs. Especially handy for you: you only have to transfer the finished transfers to your desired textile in your transfer press - done! You will receive already released transfers on a carrier paper in which no contour cutting or plotting is necessary. 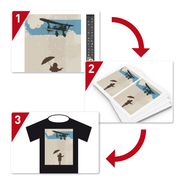 Our textile transfer prints can be used in many ways; Printable objects are textiles of all kinds, such as T-shirts, jackets, sweaters and trousers as well as suitcases and bags, caps, hats and even umbrellas. Be creative and reach your desired product in a few steps. You can order from 20 up to 600 DIN A3 sheets via the SIEBDRUCK printing service, with the READY service we can even print on request up to 10,000 sheets. The special thing about the YOW! 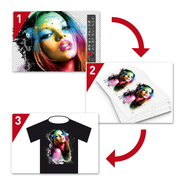 READY Textilransfer is the printing of a variety of full color motifs (drawings, pictures, monochrome, multi-colored, with gradient, effects or transparency), which you can transfer to the textile independently using your transfer press. Just let us guide you through our simple steps: first, upload your motif (1), then enter the carrier characteristics (2) and finally determine the desired production period (3). With the so-called SIEBDRUCK textile transfer, you can choose from a wide range of colors, including 1-5 printing inks, 30 basic colors and several special colors. Various special effects are also possible here, and the transfer to the object to be printed is carried out independently by you. Here you will get to your desired product in five simple steps (motif upload, color settings, carrier features, additional options, production time). In addition to bright and high-quality prints, YOW! To you as soon as possible of your ordered goods. Trust our expertise - let your creativity run free and order your favorite motif today!